We’ve covered the VAT basics in the previous post. But unfortunately life isn’t always simple. It has a nasty habit of getting complicated with lumps, bumps and hiccups along the way. Here are some of the more complex VAT issues including a few big VAT wolves that I hope you’ll never encounter. Can I claim VAT on purchases from before registration? When you register for VAT and complete your first VAT return, you’re allowed to include certain items that you purchased before you registered. This can help ease the pain of the first return and in some cases can result in a refund. You can claim the VAT on any goods (fixed assets or stock / materials for sale) that you purchased up to 4 years before registration, providing they are still held by the business. You can also claim VAT on any services purchased within the last 6 months. How do I deal with sales and purchases outside the UK? This is a huge topic in its own right and beyond scope of this post. 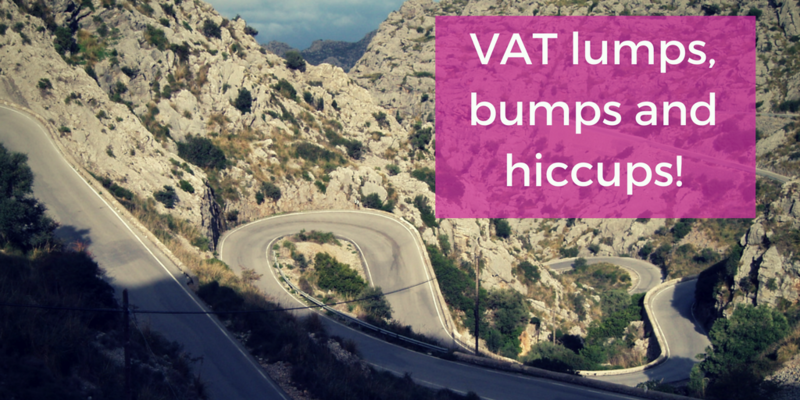 If you need more information on EU VAT then this article covers the basics. Help, I don’t understand EU VAT! What if I’ve accidentally gone over the VAT threshold? If you went over the threshold in the last month then it’s not a problem. You have 30 days from the date that your turnover went over to notify HMRC and register for VAT. Unfortunately a more common scenario is not to realise that you’re over the threshold until you’re preparing your year end accounts. This could be up to 9 months after the year end and anywhere up to 21 months after the threshold was crossed. In this scenario it can be very tempting to register, but only from the current date rather than the date that the threshold was crossed. However if HMRC realise that this has been the case, you’ll still have to pay the VAT due from the original date and there will also be a large penalty on top of this. If you find yourself in a late registration situation the best option is to confess all and be honest. You will have to pay the VAT that is due on your sales since the date you should have registered and may have also have penalty. However registering voluntarily will improve your chances of a lower penalty. If you register voluntarily then you should get the chance to submit correct VAT figures for the missing periods. However, if HMRC have reason to believe that you’ve gone over the VAT threshold, they will automatically register you for VAT. They’ll make an estimate of the VAT that you owe and then base any penalties on this estimation. This may be very different from the true figure. What are the penalties for late VAT registration? Late VAT registration falls under the umbrella of “failure to notify penalties” which are based on whether the error was accidental, deliberate or deliberate & concealed. The penalty amount is calculated as a percentage of the missed tax. If you notify HMRC voluntarily within 12 months of the date that you should have registered and are able to show that it was an not a deliberate error, the penalty should be no more than 30% of the tax due and at best case it could be nil. More than 12 months late and the penalty increases to 10-30%. At worst case if HMRC feel that you deliberately avoided registration and concealed your error then you could end up owing 50-100% of the VAT due as a penalty. There are some grounds for claiming you had a reasonable excuse, but they are very restricted and lack of knowledge is not one of them. Neither is the fact that you were relying on someone else to prepare your finances. The more open and up-front you are about the error and the sooner you let HMRC know, the more change you have of a low or even nil penalty. For more detailed guidance on exactly how penalties are calculated see the HMRC handbook. Overall it’s far, far better to keep on top of your sales turnover and make sure that you register at the right time so that you can avoid the risk of penalties all together. What about late submission or late payment? The penalties for late submission depend on your turnover and also how many previous late returns you’ve had in the last 12 months. The penalty, known as a surcharge, is based on a percentage of the VAT due for the quarter. If HMRC don’t have your VAT figures for that quarter then they’ll make an estimate for the surcharge. If your turnover is below £150,000 then you don’t incur any surcharges until the 3rd late return when it’s 2% and even then there may be nothing to pay until the 5th late return if the amount of VAT you owe is very low. If your turnover is over £150,000 then the surcharges kick in earlier, at the 2nd default rather than the third. The maximum surcharge is 15% of the VAT that was due for the quarter. If you submit the return on time but fail to pay the VAT then HMRC will charge daily interest on the amount due until it’s paid. What if I go over the VAT threshold but it’s only temporary? If your turnover goes over the VAT threshold but you know it was a temporary, one-off event, then you can ask HMRC for a registration exception. This has to be done in writing within 30 days of the date you went over the threshold. You have to provide evidence to back up the fact that you won’t be going over the threshold again in the next 12 months. HMRC will then make a decision on whether to give you an exception or whether to register you for VAT. The threshold to deregister for VAT is lower than the registration threshold. In 2017-18 you have to register when your turnover is £85,000 but your turnover has to be below £83,000 in order to deregister. You can de-register if the business is ceasing, your turnover has gone below the threshold or you know that it will be below the threshold over the next 12 months. If you are deregistering because your turnover is decreasing, you have to give some information about why this is the case – what’s the change in circumstances that will cause a decrease in sales? The easiest way to deregister is via your online VAT account. There’s a link to follow that takes you through the deregistration process. Once the application is submitted, you wait to hear whether it’s been accepted. Once you have deregistered you will have a final VAT return to complete from the start of your current VAT period to the deregistration date. This will be due a month and 7 days after your deregistration date, which could well be a different date to your usual VAT deadline so don’t get caught out! There are three top tips that will help you to keep out of trouble, smooth the VAT process and help your cashflow. 1. Do your bookkeeping on a regular basis, at least monthly. At the very least keep a record of your sales each month. That way you can make sure that there are no nasty surprises. If you know you’re getting near the VAT threshold, you can register in good time. Alternatively, if you really don’t want to be VAT registered, you have enough time to make the necessary changes to your business in order to reduce sales – such as reducing opening hours or not taking on new work. Specialist bookkeeping software will be able to quickly and easily produce the reports you need to keep track of your sales turnover. If you do register for VAT, it should be able to produce the VAT returns. Many cloud accounting packages can integrate with your bank account to make data entry easier and allow you to digital file your VAT returns through the software. If you are VAT registered then you have to remember that not all the money from your sales belongs to you, you are merely collecting the VAT proportion of it on behalf of HMRC. You can’t spend what you don’t have, so putting the VAT aside on a regular basis, ideally in a separate bank account, can be really helpful. If you’re doing your books monthly and using bookkeeping software then you should be all set. You can use the reporting capabilities to estimate your VAT for the month and then put that money aside. It doesn’t have to be the exact VAT amount, but it should be accurate enough that when it’s VAT return time, you already have enough money saved to cover the bill. Putting money aside on a monthly basis can really reduce the big quarterly cashflow hit. VAT can be an important part of your business, a necessary evil or your worst nightmare depending on how you approach it. If you’re organised and stay on top of things then being VAT registered need not be a huge hassle and could be helpful to your business. However, if you’re not up to date with your business finances then VAT can be one of the biggest pitfalls resulting in substantial and costly penalties. A few simple, regular routines can make all the difference and should have other knock-on business benefits. Just don’t let your sales get away from you or the big VAT wolf might be knocking at your door…..